Advanced Product Quality Planning, or APQP for short, creates a roadmap for developing new products complete with time-based milestones and decision points along the way. A major objective of APQP is to provide a vehicle for suppliers and customers to work together when developing a new product. This helps assure that the product is delivered on time and with the highest added-value. New Product Introductions (NPIs) have a greater success rate when the principles of the APQP approach are followed. 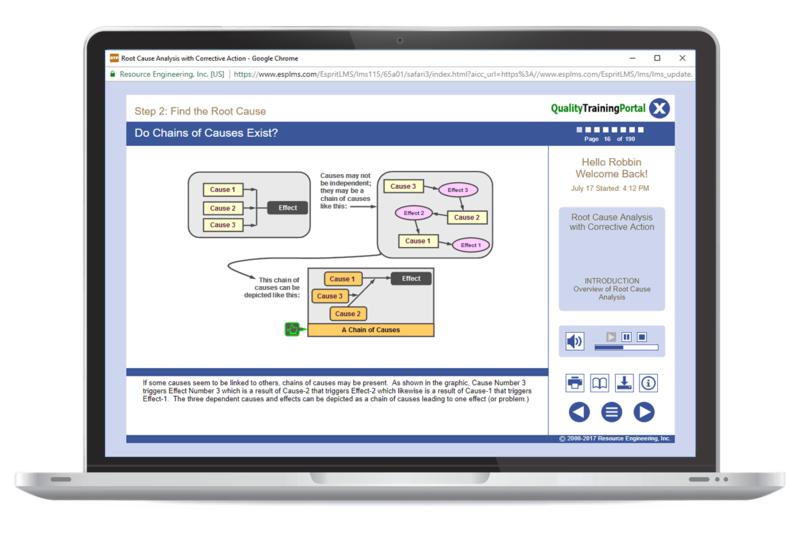 The Fundamentals of APQP training online walks learners through all phases of the APQP process beginning at Phase 0 and ends with a lesson on Control Plans. Throughout the training there are exercises and upon completion of the content, learners complete the Fundamentals of APQP Challenge that tests their understanding of the material. This APQP Training is designed for employees who are responsible for conducting or participating in the APQP process. We also offer an Overview of APQP course for managers and personnel responsible to overseeing departments responsible for conducting APQPs but who are not intimately involved in conducting them. Work through the five phases of the APQP process. Create a Design Verification Plan and Report. Use Control Plans from Prototype to Pre-Launch to Production Phases. Describe the Production Part Approval Process. Mistake-Proofing or Error-Proofing or the equivalent understanding of the difference between fixing problems after they happen and preventing problems from happening in the first place. Information and data are compiled to build a business case. The output of this phase defines specifically what product will be studied. The design of the product is fleshed out. After the design is verified, a prototype is built, specifications developed and inputs for the process design are generated. The manufacturing process for the product is designed. Major outcomes include development of the process flow and layout. Additionally, a Characteristics Matrix, PFMEA, Pre-Launch Control Plan and Process Instructions are developed. The process and the product design are validated. The output product from the production run is used to evaluate the measurement system and check the process capability. Control charts can be used to identify special causes of variation, capability studies and the use of design of experiments can help reduce common cause variation. Work to ensure the product fully meets customer’s needs. Identify control factors, control points and control methods for the product and its corresponding manufacturing process. Develop a comprehensive Control Plan. List the steps necessary to prepare for an APQP effort. Understand how Design-FMEAs can help reduce risks in the design phase and Process-FMEAs can help reduce process related risks. Be familiar with a Design Verification Plan and Report. Understand the sequential progress of Control Plans from Prototype to Pre-Launch to Production Phases. Understand how Engineering Change Requests generate vital documentation. Select appropriate flowcharting and process mapping techniques to aid in design of the process. Be familiar with a Characteristics Matrix to plot the relationship between product parameters and operational steps of the process. Know the importance of Measurement System Analyses and a Preliminary Process Capability studies in evaluating the process and product output. Be familiar with the Production Part Approval Process. Know about tools and techniques that are used to continuously improve both the product its corresponding process. Work to ensure the product fully meets customer's needs.